What comes to mind when your thinking of cave diving? You guessed it Caves and those the dark eerie, undiscovered things could be found there, that maybe should stop in a cave. Cave diving is not for the faint hearted and it should not be attempted unless you seriously know what you’re doing and you have passed a cave diving course. Even if you can see the back of the cave you should not enter as you never know what danger is hiding in there. In the darkness, stirring up the mud and silt can be the ultimate nightmare scenario. 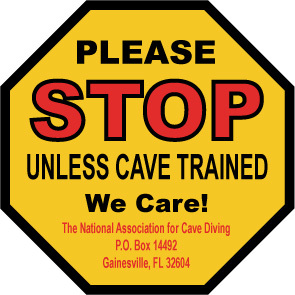 Cave diving training includes teaching you how to move under water in a way which will minimize this happening. The current might also be unpredictable and strong. Caves either surface as springs, which have current that flows out, or siphons which have a current flowing in. Air management -the rule of thirds comes in to play here and if you don’t know what this is cave diving is not for you at the minute….. the rule of thirds is one third of gas is for the outward journey one third for the journey back and when you have a diving buddy a third for him just in case. Depth – gas intake and decompression obligations increase in depth and is very important not to exceed your dive plan and watch out for nitrogen narcosis. Training – is unequivocally essential and is usually given in stages to build up self-assurance knowing your limit is very important. SAFETY FIRST – enjoyment second and don’t do anything you might regret.